If you’re in the market for hair extensions, you probably already know there is a wealth of possibilities out there. All these choices can be a bit overwhelming, so today, we’re going to cover clip-in hair extensions. Kimberly Gore Salon is one of the top beauty salons in Columbus, GA. Take a look at our extensive hair services menu, where you can find cut, color, relaxing, and yes, clip-in extensions. To get started with your new look, contact us now. Not sure where to start? You can always give us a call and we can go over the pros and cons of each type to help you make a decision. 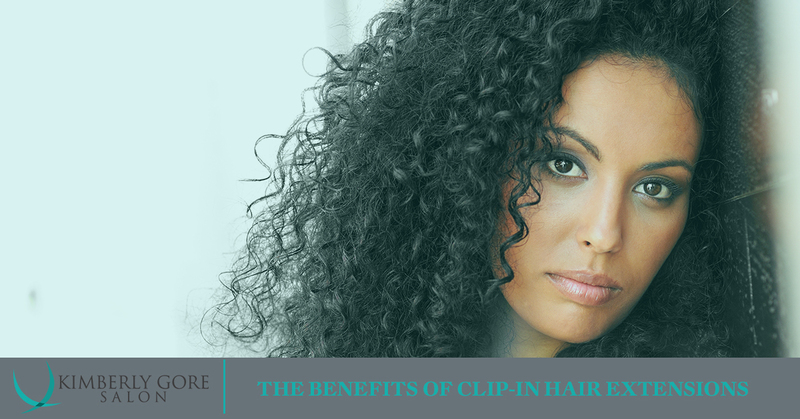 Here are some of the benefits of going with clip-in hair extensions. One thing women worry about when choosing extensions is that they’re going to damage their hair. Some methods for adding them can be damaging, but the clips are not! This is a great alternative to weaving, gluing, and braiding if you have fragile hair. After your appointment with us, where we’ll select your hair and style then install the extensions, you can easily put them in and take them out on your own. That way, if you want to save them for special occasions or work and take them out when you’re working out, for example, you have flexibility. And since you won’t be sleeping in them, this will encourage new, healthy growth of your own hair. When you buy ready-made extensions, you’re not likely to find a set that matches your hair exactly. The beauty of real hair extensions is that you can color them to match your own hair flawlessly. We love that with clip-ins you can move them around to just the perfect spot for your hairstyle that day. You have so many possibilities for placement because of the varying sizes of the wefts, which makes them easy to adjust for just the right look. We’ve already mentioned the ease of installation, which is a huge bonus. After you get the hang of them, you’ll be able to get your entire head done in just a few minutes. Taking them out should take less than a minute. Ask your stylist for tips on this and she’ll be happy to show you techniques. Depending on how often you wear them, how you style them, and other factors, your extensions can last several months. If you bleach or heat-style them, their longevity can go down some, however. Be sure to ask your stylist for tips on making them last as long as possible. Clip-in hair extensions offer so many benefits, and they’re a fantastic option for looking fab in a flash. Take a look at Kimberly Gore’s hair services menu to see all we have to offer. When you’re on the hunt for incredible beauty salons in Columbus, GA, call Kimberly Gore today!